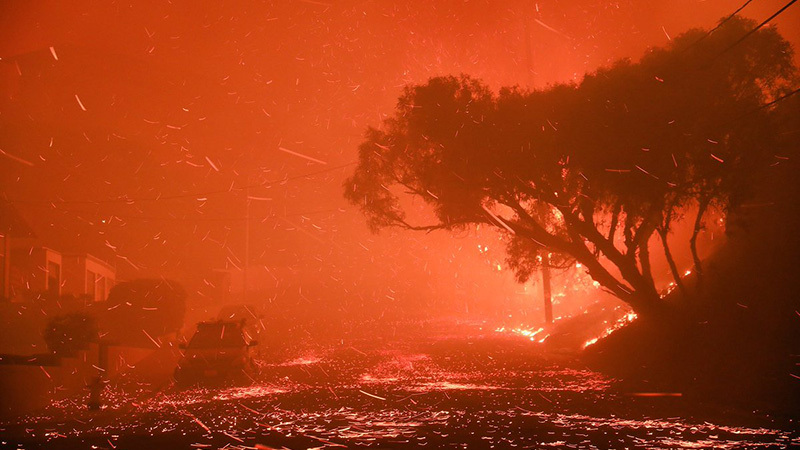 I am not trying to compare any of what's happening to me with a real peril many people have dealt with, are now facing or will experience, for instance, in California where this image is from. This is a real hell breaking loose. Mine is a bump. I am only heading towards a new dawn. Today my staff-leaving announcement is out—and the… gate to the future breaks loose—officially. I am leaving the Bank in a month’s time. Hey, who said hell broke loose?! Watch it there! Now that the new website is up and running, check it out www.nib.int, I thank everyone—many people actually, I have counted 57—who have been involved in the project contributing, commenting, developing, criticising, being annoyed by me hovering constantly over them and asking for this and that, boosting my morale, leading and supporting me, correcting me, being in a team with me. Thank you all for this great job! Whoever is actually hearing me on this page, not many, I assume. Now I can leave, in confidence that the Bank, for a while as it is, is armed with a modern online tool, and that my colleagues will take the best care of it. There is time for everything as they say and, after 13 and a half years at NIB, the time has come for me to move on. I don’t know yet what the next step in my career will be, but I am certain the experience I gained, all the things, professional and personal, teamwork and relations, all the magic I learned during my time at NIB—all of it—is a huge fortune, a dowry for my next relationship. It will never melt. Those 13 annual rings, like in trees, will never disappear. The annual rings in me—it’s not just NIB that is written all over them. It’s Finland. It turns out ever since I graduated from university back in 1992, there has been more Finland in my life than any other country, yes, even Latvia. I must say the idea of moving my magic and my annual rings someplace else didn’t strike me last week. I really had been entertaining it for a while. At one point, when the decision had finally matured, I discussed it with my boss. In search for a less scratchy exit strategy, he suggested I finish up the website project which would leave the Bank with a functioning tool and me with a happy and all-satisfying feeling of having made a difference. Can you think of a better exit strategy? …Until I came across a study programme at a university—an MBA in Public Affairs and Leadership at Quadriga University of Applied Sciences in Berlin. I fell so much in love with this idea that I put myself into the project mode and started digging. It took me four months to get enrolled. That’s nailed for the next year and a half, or so. Next port of call Berlin.